Retirement account assets will be paid out according to your beneficiary designations, not your will. To control how beneficiaries access assets, consider using a Special Beneficiary Restriction. 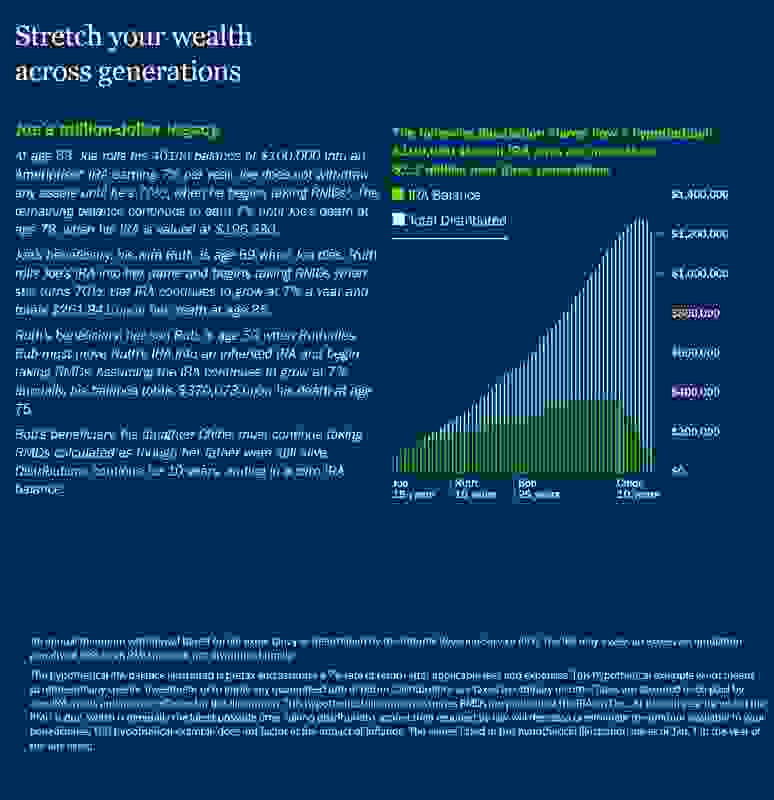 A stretch IRA strategy can be a tax-efficient way to pass along assets. The beneficiary(ies) named on each of your retirement plans will be the recipient(s) of your money — even if your will gives different instructions. To ensure you've named the right people and provided the necessary information, you should regularly perform a beneficiary review of your accounts. You should also consider consulting a financial advisor or estate planning attorney to discuss beneficiary designations for your particular situation. Identify a new heir after the death of a primary beneficiary. Remove an ex-spouse after divorce and/or remarriage. Update your beneficiary forms after you marry, or after the birth or adoption of children. For plans or states that require it, complete a spousal consent form if you name a beneficiary other than your spouse. This can easily be missed after a remarriage when children from a prior marriage are named as beneficiaries. Complete a separate beneficiary form for each plan, and don't mistakenly assume that a separate beneficiary can be designated for individual accounts within a plan. Consult an estate attorney before naming an estate as beneficiary. There may be significant disadvantages to naming an estate as a retirement plan beneficiary. Life insurance policy beneficiaries receive the income tax-free. Trustees (often a legal entity rather than an individual) take charge of managing, investing and disbursing the money in a trust. You need to name contingent, or secondary, beneficiaries as well as primary beneficiaries. Federal law requires that a spouse must be the primary beneficiary of a pension plan account, unless this right is waived in writing by the spouse. Anyone can be named the beneficiary of an IRA (Community property states require spousal consent). Non-adult children require special planning. A custodial account such as an UGMA/UTMA or a trust may be an appropriate beneficiary in these situations. If a minor is named outright, there will have to be a court-appointed guardian. Note: Not all non-qualified accounts allow you to designate beneficiaries. For those accounts, transfer on death (TOD) registration or joint tenancy may be an option to help your beneficiaries avoid probate. Your financial advisor can help you understand your account registration alternatives. If you want control over how IRA assets are distributed to your non-spouse beneficiaries but you do not require the specific control that a trust offers, you may want to consider a Special Beneficiary Restriction. Ameriprise Financial is one of very few firms to offer this feature that provides a basic level of control without the cost and complexity of a formal trust. Under a typical stretch IRA1 strategy, the IRA owner takes any minimum required distributions from the IRA until his or her death. At the death of the owner, any surviving spouse beneficiary rolls over to his or her own IRA and takes any required distributions. After the death of the surviving spouse, non-spouse beneficiaries (typically children) take required distributions from separate inherited IRAs over each of their life expectancies. Any subsequent beneficiaries of the inherited IRA can continue taking distributions based on the life expectancy of the initial beneficiary. As you see below, this can result in substantial wealth passed to the next generation. If you are interested in exploring Special Beneficiary Restrictions or stretch IRA strategies, your Ameriprise financial advisor can review the details and help you determine what's right for you and your family. 1 A stretch IRA is not a type of IRA but provisions within the IRA plan that allow beneficiaries to generally take distributions based on their life expectancy. This information is not intended as legal or tax advice. Please consult with your legal and tax advisors regarding your individual situation.